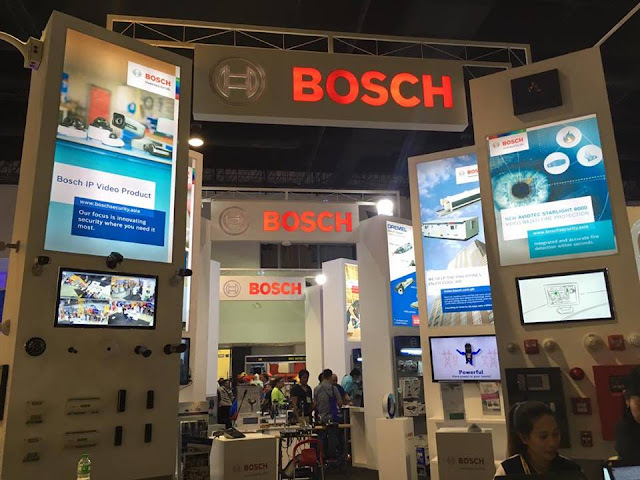 German industrial and technology solutions provider Bosch showcased its extensive portfolio of innovative products for construction and security systems in the recently concluded PhilConstruct 2016 held at the SMX Convention Center, Mall of Asia Pasay City. Power tools from Bosch Professional and Dremel, as well as Video Surveillance systems, Fire Alarm & Evacuation systems, Public Address and Conference systems were on spotlight in the country’s biggest construction convention that gathers industry professionals, construction dealers and global brands. Bosch had put forward its fascinating array of surveillance systems that excels in exactitude, user-friendliness and efficiency. In the four-day convention, Bosch displayed its completely new portfolio of DIVAR network and hybrid recording solutions. Tailored to fit the growing needs of small and medium businesses, Bosch’s DIVAR system is specifically designed for 24/7 operation. It also offers advanced operator management which enables users create video surveillance solutions with professional security features that are easy to install and simple to use. Bosch also headlined AVIOTEC – the brand’s newest video-based fire detection system, which spots fires and disturbances, predicts behavior to reduce false alarms and speeds reaction time - helping users stop threats before it spreads. “The market for surveillance technology demands unparalleled visibility, and Bosch continues to build out its products with improved functionality to ensure that all its customers’ needs for security measures are provided,” said Rowena Bonifacio, Country Sales Manager of Bosch Philippines Security Systems. Also present were Bosch Professional cordless tool ambassador and upcyclist Paco Pili, Dremel ambassadors and woodworkers Kenny Ansis, Sonny Limjap, and “Toymaster” Dennis Mendoza, who all took the main stage and led engaging demonstration workshops using Bosch power tools and Dremel multi tools. Bosch customers and visitors were offered exclusive deals and discounts of up to 50% on select products from its various power tool lines, Bosch Cordless Tools, Bosch Contractor’s Choice range, Bosch Measuring Tools, and Dremel Rotary Tools.